Combine 3 tbsp olive oil, garlic, parsley, salt and pepper in a large bowl. Add lamb chops and toss to coat. Cover tightly with saran wrap and refrigerate for 30 minutes. While lamb marinates, make the smash. Boil carrots in hot, salted water for 20-25 minutes or until very soft. Drain and return to pot. Mash in remaining olive oil and gorgonzola. Season with salt and pepper to taste. Smash until very creamy with few chunks. When lamb has finished marinating, remove from refrigerator, uncover and bring to room temperature, about 10 minutes. Heat a grill pan or regular grill to high heat. Grill lamb chops for 4-5 minutes on each side, depending on desired doneness. 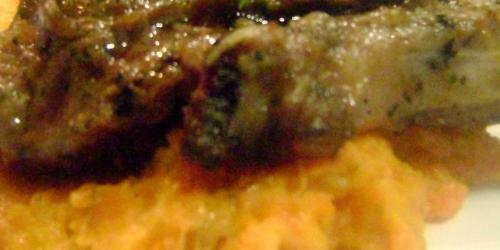 To serve, spoon a bit of the carrot smash onto a plate and top each pile of smash with a lamb chop. Garnish with more parsley if desired. The broke gourmet is offering much delicious food than the vegetables that is the grilled combs. As we know that meat has much proteins according to the some scientific things, we must eat this food to keep ourselves healthy. Share this article so that people know more about it.